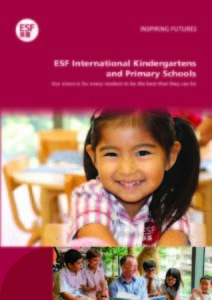 ESF primary schools are international schools that cater for students in Year 1 to Year 6. All students engage with the International Baccalaureate Primary Years Programme (PYP) which is an international, trans-disciplinary programme designed to foster the development of the whole child, not just in the classroom but also through other means of learning. The PYP focuses on the total growth of the developing child, encompassing academic, social, physical, emotional and cultural needs. Our schools provide a wide range of curricula and co-curricula programmes and opportunities. the written curriculum — what do our students learn? the taught curriculum — how do our students learn? the assessed curriculum — how do we assess our students? Our schools aim to develop internationally minded students by encouraging the development of the traits described in the IB learner profile. We support children to become inquirers, thinkers, communicators, risk-takers and to be knowledgeable, principled, caring, open-minded, balanced and reflective. All of our schools are authorised IB World Schools. To find out more about the IB Learner profile, visit http://www.ibo.org/programmes/profile/ for more information on the IB learner profile.